I’m surprised I haven’t seen selfie disipline like this before. 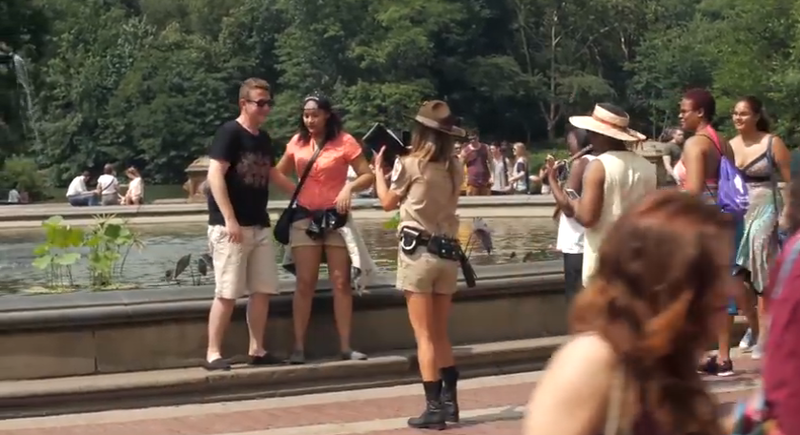 In a You Tube video by Jena Kingsley, the presenter plays a prank on visitors to Central Park by dressing up as a cop and telling people not to take selfies. A surprising number comply, as if such an order could in any way be rational. Kingsley starts her video by emoting to camera about the evils of selfies, and the need for someone to step in to stop the madness. 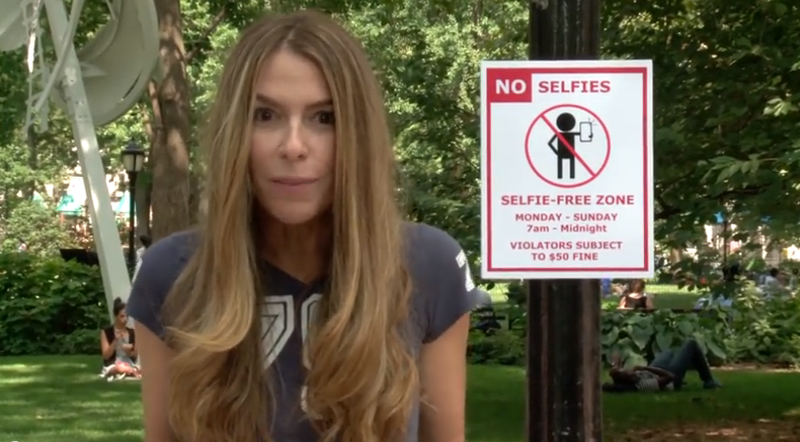 Behind her, a sign declares that this is a ‘selfie-free zone’ from 7am to midnight, and that violators are ‘subject to $50 fine’. The details are something we are familiar with – directives with time limits and penalties – which goes some of the way to explaining why this prank is possible. Forms of micro-discipline guide our behaviour every day, from no-smoking areas and grass that cannot be walked on, to the no-touching or no-photography rules in art galleries. So we are used to being told what, when, where and how we can do things. But these directives have a limit, and mostly relate to one’s harmonious participation in social spaces. So I would also argue that this stunt relies upon the cultural messages regarding selfies, which problematise the practice as something socially objectionable and worthy of condemnation. As a result of the kind of texts I have been examining on this blog, people’s enjoyment of taking selfies is always tempered with the understanding that they are some way illicit, leaving a space in which ‘no selfie zones’ could possibly be feasible. Consider the reaction were Kingsley to have started forbidding people to wear hats, or drink water. The looks of confusion that people give her here would soon turn into outright anger, and she would very quickly be revealed to be just someone dressing up issuing strange and arbitrary orders. She only lasts as long as she does precisely because her target is selfies. And only selfies – plenty of people are shown to be snapping away in the background whilst she is explaining to someone how problematic selfies are – using some flimsy rationale concerning young women’s self-esteem. Is the answer to young women’s low self-esteem to bring in more regulation concerning their behaviours? Her argument makes no sense, but then I assume it is not meant to. At one point, Kingsley asks that people delete their selfies whilst she watches. A few are shown to comply, albeit grudgingly. In the last 15 years, photography has increasingly been problematised in a way that regards it as a potential security threat. One only needs to start taking pictures in a shopping centre or in airport security to see how vigorously ‘no photography’ rules are enforced. But here we see how this regulation has become normalised as a (potential) force enacting upon every type of photography. This is not a question of national security, but rather of enforcing social rules regarding conduct in public spaces – but yet both, at least as far as this prank goes, involve the use of the law to restrict photography. 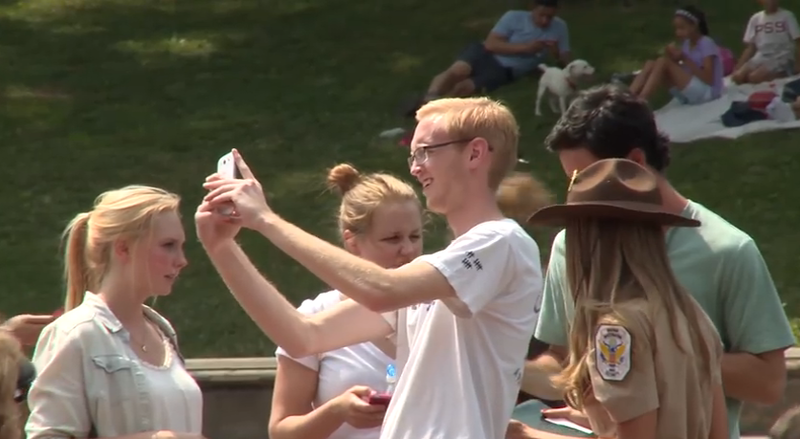 Several people are shown to take selfies with Kingsley in the background, an act that demonstrates their understanding of the regulation she espouses as being ridiculous, as well as using selfies as a means to undermine her assumed authority. The young man’s act of selfie-taking, below, is therefore both a confirmation of Kingsley’s understanding of selfies as mischievous and uncontrollable, and an act of resistance to that interpretation. Towards the end of the video, Kingsley offers to take photographs of several of her victims, reaffirming that some types of photograph are acceptable in contrast to the selfie. I would love to hear her explanation for this – for why it is so objectionable for a couple to photograph themselves, but yet it is fine for her to take a picture of them? It is at points like this that the ‘logic’ of selfie-taking as devalued starts to break down, and it becomes most apparent that these rules and assessments are purely arbitrary. At the end of the video, Kingsley is confronted by a member of the park security and told to leave the area. After all, in his eyes, she is a nuisance to visitors; marching around micro-managing people’s leisure time whilst dressed as a cop (in itself a problematic and possibly illegal behaviour, I would have thought). 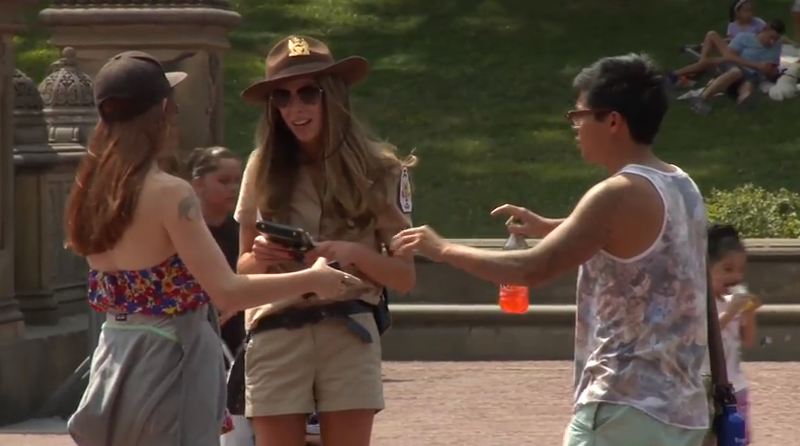 By asking her to leave, the park guard is not just reasserting the park’s status as a space for personal relaxation, but also confirming that the social rules that ensure every visitor’s safety and enjoyment do not include anything regarding selfies. The arm outstretched in a gesture of dismissal is therefore a means for protecting the right to similarly reach out one’s arm and take a selfie.